We were in Cebu for one day, as a layover for our flight to Siargao (we did a Manila-Cebu-Siargao route, which is cheaper than a direct flight to Siargao). So, what are we going to do for one whole day? 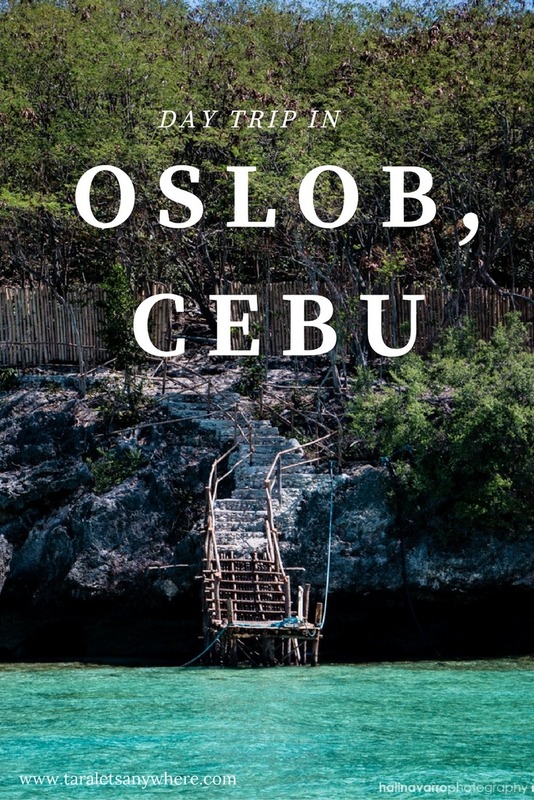 One obvious choice is a city tour, but in the end we’d voted to for a more adventurous Cebu day tour option — going to Oslob. We hopped on an early-morning bus to Oslob in the South Terminal in Cebu and dropped our bags at MB Sunset View’s Resort. There are other alternative resorts in the area, and the only reason we chose this resort was it was closest from our drop-off point. 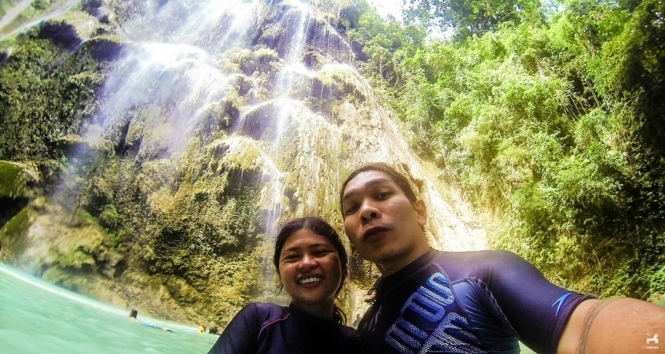 We started with an early morning swim with the local sea creatures known as butanding or whale sharks and ending with dipping in the cold pools of Tumalog Falls. By about 4PM, we were back at the resort, tired and satisfied. 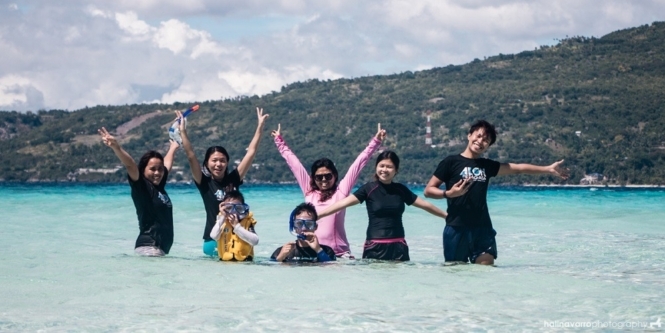 Here are the details of our jam-packed Oslob day trip. Before everything else, we attended a short orientation on whale shark watching. It’s mandatory. 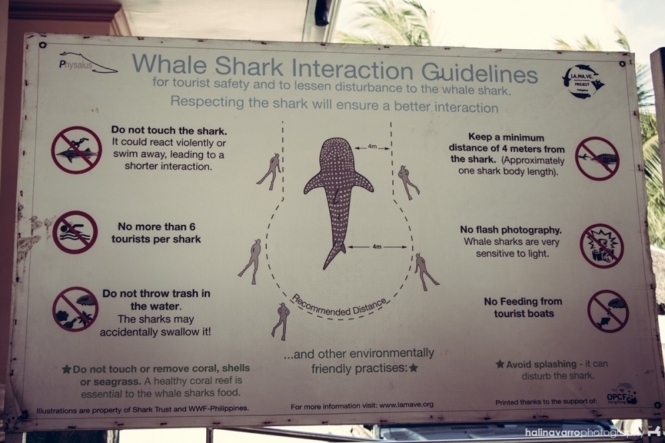 The most important points to remember are these: (1) do not touch the whale sharks and keep a reasonable distance, (2) do not apply sunblock because sunblocks contain chemicals that are harmful to these sea animals. We swam and took pictures with the whale sharks, which are known as the gentle giants of the sea. The tides were so strong that it was difficult to navigate in the water. A guide pulled me by holding my life vest on the back and then asked me to dive. I couldn’t because of the life vest, so the guide helped by pushing me down. The next thing I knew there was another guide taking photos of me with a whale shark. If you know how to swim, leave off the life vest in the boat to get a good picture. I was amazed because we didn’t have to go far from the beach to see the whale sharks. They were literally swimming less than a hundred meters from the shore. They just glide in ones or twos or threes, with their mouths hanging open. I could also understand why they were described as gentle sea creatures. With all the confusion, the strong waves pushing and pulling us in the sea and the number of other tourists in the area, somehow MG and I accidentally kicked a whale shark while paddling and neither of us sustained injuries or had got eaten. The local organizers prescribe a distance of 4 meters away from the shark, but as I’ve mentioned this is not always the case. Twice, Hali dived and got hit by the tail of a whale shark swimming past. 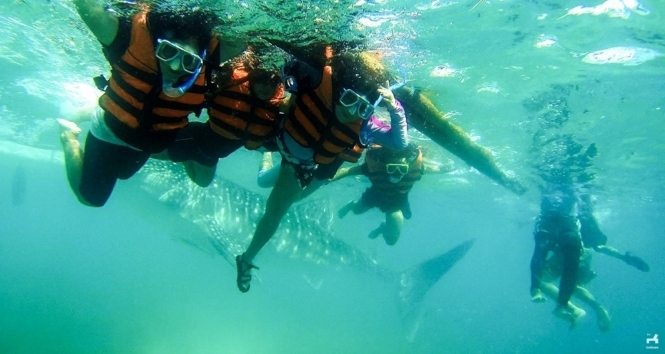 Swimming with the whale sharks in Oslob costs P500. It’s a tad expensive for a 30-minute activity, but it was a fun and definitely not something to be missed on an Oslob day trip. If you don’t have a GoPro, you can ask your tour coordinator for unlimited GoPro shots saved in a CD for P550. Whale shark watching activity closes at midday, so make sure to go there in the morning preferably before 11 AM. Actually the best time is early in the morning since the boatmen also considers the strength of sea current. P.S. After this trip, I’d read about whale shark watching in Oslob and found out that environmentalists are against this activity. Therefore, I recommend getting informed why whale shark watching in Oslob can be harmful and why it’s better to do the one in Donsol, Sorsogon, instead. Here’s further reading on ethical animal encounters around the world. After having breakfast in the resort, we contacted the resort staff to arrange us a boat for a Sumilon Island day tour. 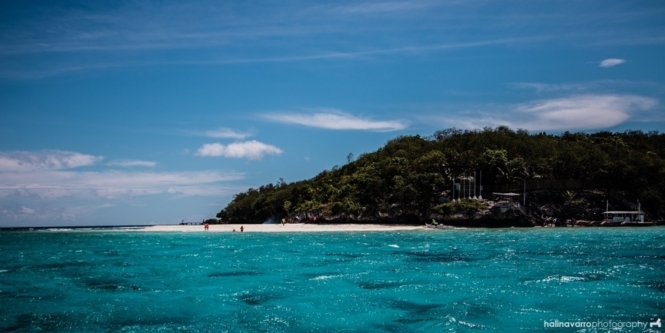 Sumilon Island is just several minutes away from the beach with the whale shark watching activity. The island features the famous four-star Bluewater Sumilon Island Resort, but boats on a day tour may only stay in the sandbar. We stayed here for a few hours, and it was time well spent. The water was clear and then turns a beautiful deep blue. The waves were strong. Beside the sandbar there’s an area with picture-friendly seaweeds as well. The water cascade is probably a hundred feet or so. It’s so high it was difficult to capture the entirety in the camera. 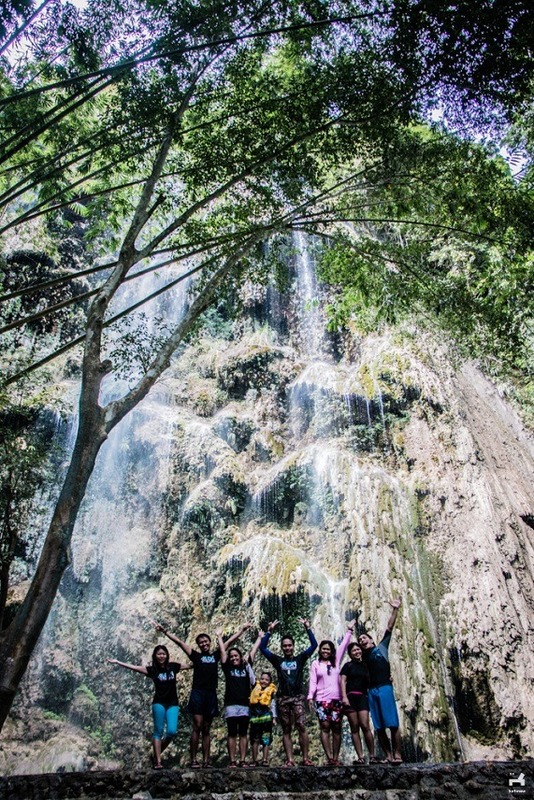 Tumalog Falls features umbrella-like rock formations, and the water falls gently from above. The water at the bottom of the falls is collected in a man-made pool, as are the waters on lower elevations. The pool was shallow and freezing cold, the kind of cold that will make your teeth shatter. Interestingly, I had googled Tumalog Falls after the trip and noticed that the cement pool walls were a recent addition. I think I would’ve preferred it au naturale, but that’s the price of commercialization. As long as the locals and local tourism office keep it in great condition, I’ll be happy. 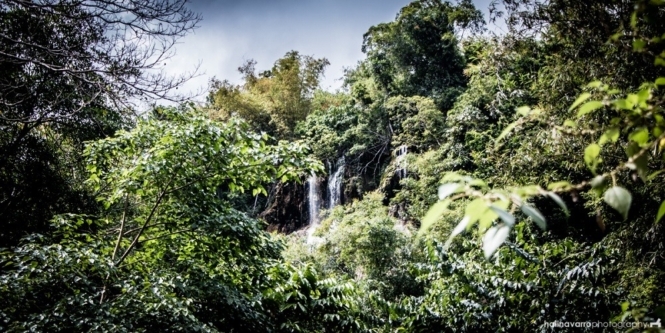 Tumalog falls is a beauty to behold. I’d recommend it to anyone visiting Oslob for a day. Our original Oslob day trip itinerary included sunset viewing in Osmeña Peak, but since we were all tired, not to mention the fact that we had a small boy with us, we decided to skip this part. I think it would be a good destination for backpack travelers though. We had a limited day to explore Southern Cebu, but next time we’ll be glad to explore Kawasan Falls as well, which is just within the vicinity. Cebu also has other beaches aside from Sumilon, the best ones of which include Malapascua Island, Bantayan Island and Camotes Island. P.S. This post is part of our 5-day Cebu-Siargao trip. Check out our main article or see other places we’ve been to in this trip! If you like this post, feel free to share it in Pinterest! Hi. 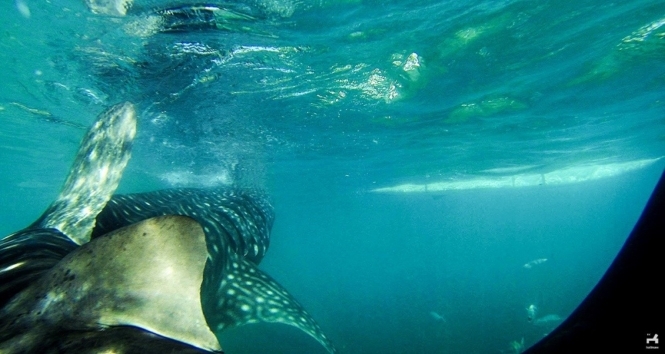 Just want to know if you can book directly in oslob for the swimming with the whale sharks? And can we join other groups for this activity to cut the cost since the tours i’ve seen in various websites are expensive for 2persons? Thank you. I’m planning a day tour for Oslob for my family. Would you know any beach resorts around the area where we can wash up? What a beautiful place and an incredible experience! I feel like 4 meters is still too close for the creatures’ own comfort though, when considering their size in comparison. Was this area baited/krill-stocked to attract the sharks? I’ve read of that being done, which would be my only concern with visiting. I think so, yes. It turns out there’s a controversy about whale shark watching, with environmentalists saying it changes the natural behavior of the sea animals. I think whale shark watching in Donsol, Sorsogon, is a good alternative to Oslob. Next time we’ll do that! 🙂 We only had a day to spare because we were on a connecting flight to Siargao then. 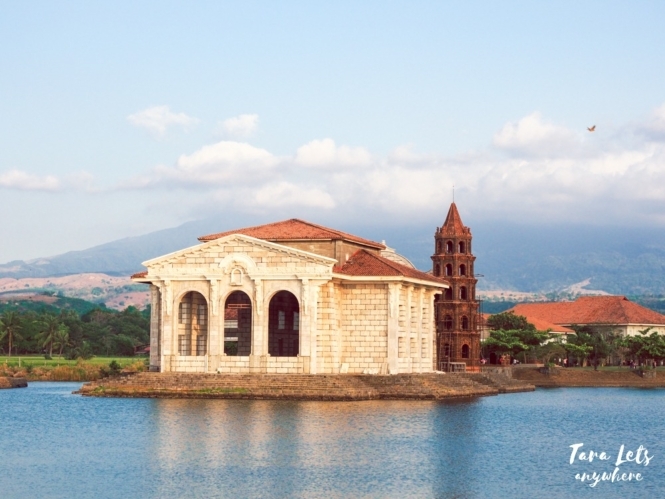 Have you been to the southwest municipalities in Cebu? I recommend boating/snorkeling in Moalboal, canyoneering in Alegria (though I haven’t tried this myself), going to the waterfalls in Samboan, Ginatilan, and Badian. Haven’t yet! This is literally the only time I’ve been in Cebu haha. 🙂 But I’ve been seeing so much photos of Moalboal, Alegria and the waterfalls you’ve mentioned I think it’s time I actually schedule another visit. I love the beach and the falls, swimming w/ whale sharks seems fun, but according to studies, it disrupted the normal behaviour of this gentle creatures. I read that as well, but that was after our trip. I’m not sure what to feel about it, I think I need to read the two sides of the argument first. I’ve been to Cebu, but never in Oslob and Sumilon. This post makes me want to book a flight ASAP and fly there. Philippines is truly amazing. You just made me fall in love with it all the more. Thanks for sharing. 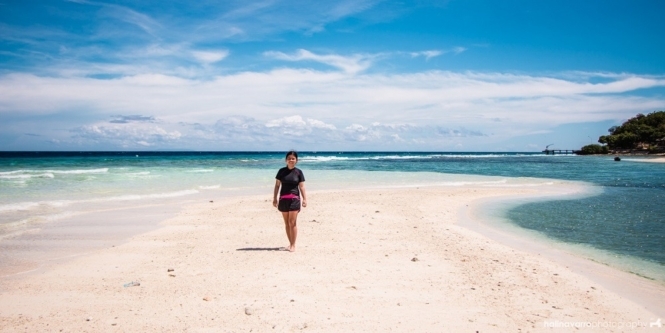 Great tips on what one can do with only a day in Cebu. If I were to choose, I would simply chill on a beach. am not the type to cover as many places as possible. I like staying at a place for a certain period of time to relax. LOL. The beach in Sumilon looks amazing! Yes it does. 🙂 We plan to go back and stay in the resort.